Because a radio ham heard strange sky noises, we may get better FM and television—and learn more about our universe. Drawings by Ray Pioch WHEN young Grote Reber was a high school sophomore, he operated 9GFZ in Wheaton, Ill., and tacked so many recognition—QSL—cards to his bedroom walls that the plaster cracked and his parents cracked down. When not communicating with El Paso, Arequipa, Capetown, Prague, and other points, he designed equipment to communicate with them even better. Nobody who knew him then will be surprised to learn that he is still in radio—listening not to the chatter of hams, but to mysterious and bothersome radio waves that come from the heart of the Milky Way. Reber—the first e is long, as in receiver— has designed and built a huge radio mirror that traps radio waves from the stars the same way that an ordinary telescope mirror traps light waves. The radio waves can be used for the same job—to explore the universe. After 10 years of experimenting with the mirror in his family’s yard in Wheaton, where the ignition system of every passing automobile broke into the stellar broadcasts, Reber has sold it to the United States Bureau of Standards and has signed on to operate it as one of the Bureau’s top radio physicists. Now, in a big, quiet field in Virginia, 40 miles west of Washington, the 35-year old former ham is ready to work full time decoding the messages from space. The Bureau expects these messages to help answer at least one question of immediate, practical importance: Where shall FM and television stations be located? They may also influence the design of new high-frequency equipment. 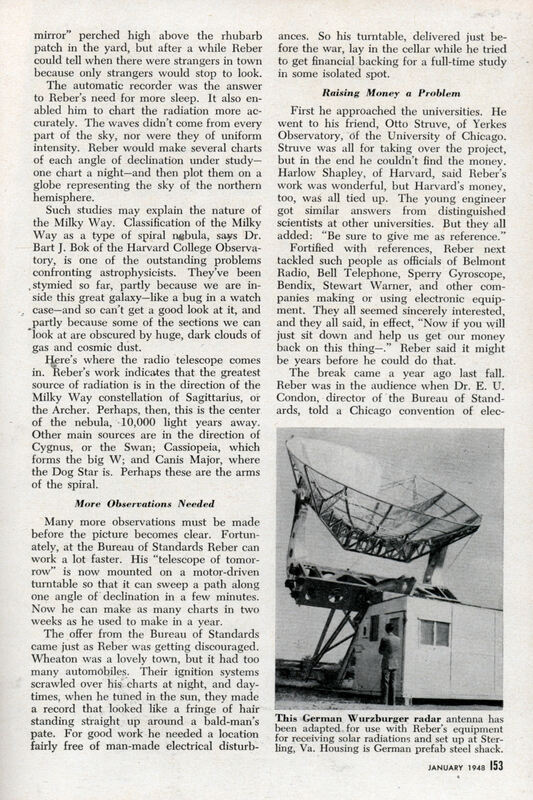 For Reber’s telescope already has shown that radiation from the great beyond comes in on the same frequencies as those used for FM, television, and radar. It is, in short, cosmic static, and on these frequencies it can be as upsetting as ordinary thunderstorm static on the much lower home-broadcast band. Military Use Foreseen Furthermore, Reber’s big mirror may have some bearing on any future war. 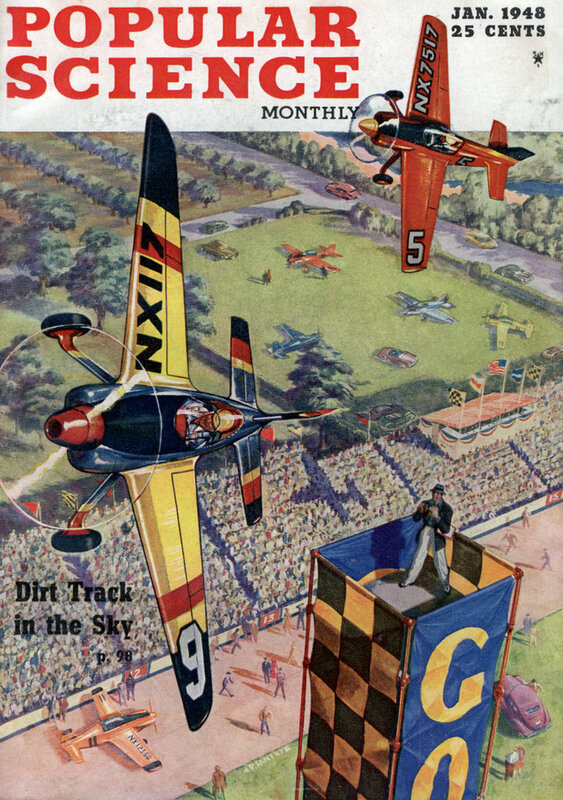 During World War I, pilots commonly hid in the sun, either to escape enemy planes or to pounce unexpectedly upon them. Radar spoiled that tactic in World War II. But static comes from the sun as well as the stars, and sometimes floods the atmosphere with strong radio waves. If these great outbursts can be predicted—and Reber’s technique makes it possible to study them more carefully than ever before—planes will be able to zip into an enemy’s territory while his radar is temporarily jammed. Neither Reber nor anyone else at the Bureau even hints that this possibility had anything to do with his being hired, but it is a fact that the armed services supply the money for many a radio research project, including this one. Beyond these practical aspects, the radio telescope is expected to help chart the shape and size of the Milky Way, which is our part of the universe; to probe into the mechanism of the sun; and to identify cosmic material too dark to be analyzed by the ordinary spectroscope. Reber’s apparatus looks like a gigantic parasol made of glistening sheet iron. This mirror captures electromagnetic energy the same way the mirror of an ordinary reflecting telescope captures light, and then focuses it on a drum 20 feet above the mirror’s center. Inside the drum are a pair of cone antennas, which convert the stellar radiation into alternating current. This is fed from the cone tips to a five-stage amplifier and then rectified. The resulting direct-current voltage passes into a recorder, which charts its intensity. Sweeps Out Hath in Sky Just as in other big telescopes, the mirror is mounted on an east-west axis so it Can be pointed to an angle of declination between minus 32.5 degrees and plus 90 degrees along the north-south meridian. As the earth rotates, the telescope sweeps out a path in the sky along the angle the observer has chosen. Down in ^he housing at the base of the telescope, a pen automatically draws a line on a strip of paper—just as in the machines used to record electric waves from the heart or the brain. The chart moves six inches an hour. The line is straight until radio waves from outer space are intercepted; then it moves up, the height of the move measuring the intensity of the radiation. This difference between solar and stellar noise is .one of the reasons Reber doubts that the two phenomena have exactly the same cause. Another is the fact that the sun and the Milky Way come in with the same intensity on one frequency but with widely varying intensities on others. If the cause were the same, he says, we would not expect the radiation to be of the same strength since, after all, the sun is much closer than the Milky Way. But we would expect the ratio of intensity to be uniform, no matter what frequency the waves came in on. However, it isn’t. Reber has been tuning in the heavens for 10 years, but, until recently, he was unable to give full time to the job or use certain refinements in his mechanical and electronic equipment. What started him off was a series of scientific reports by Karl G. Jansky, of the Bell Telephone Laboratories, that were published in the Proceedings of the Institute of Radio Engineers. The first of these appeared in 1932 when Reber was studying at the Armour Institute of Technology. Jansky had set up a rotating an- tenna at Holmdel, N. J., to study the direction and intensity of ordinary static and had been surprised to find himself recording not two kinds of static but three. The first was from local thunderstorms, the second from distant thunderstorms. With scientific caution he described the third kind as “a steady hiss-type static of unknown origin.” He thought at first that it was coming from the sun but later concluded that the Milky Way was generating most of it. The mirror was fairly easy to make. He bolted together nine pie slices of sheet iron for the middle of it, and added 36 lengths around the circumference. He fastened it to wooden ribs with screws. The electronic equipment, particularly the amplifier, was tougher. He tried out a frequency of 3,300 megacycles. He got nothing, and he got nothing on 910. At these extremely high frequencies his original apparatus was too insensitive to pick up the waves from space. Finally Makes Contact He kept trying. “You know how it is,” he says. “You start off cheaply and you keep figuring that if you spend just a little more you may get somewhere.” What Reber spent would have bought him three automobiles. One bright midnight in October of 1938, 15 months after he had completed his first model, he pointed his telescope at the Milky Way and then hurried into the cellar of his home to watch a little meter he had rigged up. It looked like the speedometer of an automobile. The frequency was 160 mc. As he watched, the needle slowly rose from the base line. The young engineer plugged in a headset. From the direction of the constellation Sagittarius came a hiss. Eventually, Reber could afford an automatic recorder to. take down the stellar broadcasts, but in those early days he had to rely on the meter. Night after night he would take readings—every minute, beginning at midnight. He couldn’t get accurate results before then because the Reber home was only two and a half blocks from the railroad station and a block from a parking lot, and every time a car passed he could hear all its spark plugs popping. Even after midnight he got interference from ignition systems and electric switches. He made his readings every minute on the minute until six in the morning; then he would grab a couple of hours’ sleep and drive into Chicago to design electronic equipment, first for Stewart Warner and then for Belmont. At first the neighbors pestered him with questions about that big shiny “shaving mirror” perched high above the rhubarb patch in the yard, but after a while Reber could tell when there were strangers in town because only strangers would stop to look. The automatic recorder was the answer to Rebel’s need for more sleep. It also enabled him to chart the radiation more accurately. The waves didn’t come from every part of the sky, nor were they of uniform intensity. Reber would make several charts of each angle of declination under study-one chart a night—and then plot them on a globe representing the sky of the northern hemisphere. Such studies may explain the nature of the Milky Way. Classification of the Milky Way as a type of spiral nebula, says Dr. Bart J. Bok of the Harvard College Observatory, is one of the outstanding problems confronting astrophysicists. They’ve been , stymied so far, partly because we are inside this great galaxy—like a bug in a watch . case—and so can’t get a good look at it, and partly because some of the sections we can look at are obscured by huge, dark clouds of gas and cosmic dust. Here’s where the radio telescope comes in. Rebel’s work indicates that the greatest source of radiation is in the direction of the Milky Way constellation of Sagittarius, or the Archer. Perhaps, then, this is the center of the nebula, 10,000 light years away. Other main sources are in the direction of Cygnus, or the Swan; Cassiopeia, which forms the big W; and Canis Major, where the Dog Star is. Perhaps these are the arms of the spiral. More Observations Needed Many more observations must be made before the picture becomes clear. Fortunately, at the Bureau of Standards Reber can work a lot faster. His “telescope of tomorrow” is now mounted on a motor-driven turntable so that it can sweep a path along one angle of declination in a few minutes. Now he can make as many charts in two J weeks as he used to make in a year. The offer from the Bureau of Standards came just as Reber was getting discouraged. Wheaton was a lovely town, but it had too many automobiles. Their ignition systems scrawled over his charts at night, and daytimes, when he tuned in the sun, they made a record that looked like a fringe of hair standing straight up around a bald-man’s pate. For good work he needed a location fairly free of man-made electrical disturbances. So his turntable, delivered just before the war, lay in the cellar while he tried to get financial backing for a full-time study in some isolated spot. Fortified with references, Reber next tackled such people as officials of Belmont Radio, Bell Telephone, Sperry Gyroscope, Bendix, Stewart Warner, and other companies making or using electronic equipment. They all seemed sincerely interested, and they all said, in effect, “Now if you will just sit down and help us get our money back on this thing—.” Reber said it might be years before he could do that. The break came a year ago last fall. Reber was in the audience when Dr. E. U. Condon, director of the Bureau of Standards, told a Chicago convention of elec- tronics men about the Bureau’s policy—to undertake research that commercial companies couldn’t do well or couldn’t do at all. Reber went home and wrote Condon that that was the sort of research he had been doing, too. Back came a letter asking if Reber would invite two Bureau physicists to look over his apparatus. Reber said sure. The visit was set for November 20 but the government men arrived a day late-three of them instead of two. It was a miserable day—cold, rainy, not a sign of the sun. Nevertheless, Reber pointed the telescope at where the sun was supposed to be, and the four men huddled around the automatic recorder in Reber’s cellar. Even Reber was amazed at what happened then. The pen recorded solar radiation far stronger than any he had previously picked up. He listened in and heard rapidly changing puffs and swishes and grinding noises, all riding on top of a steady hiss. The sun, though entirely hidden from sight, was certainly putting on a show. The visitors were impressed. But was Reber sure it was the sun? He turned the telescope to other parts of the sky, and the puffing and swishing faded out. Turn it back, they said. In came the solar static as strong as before. A few days later, Washington sent Reber a job application blank. Hobby Goes on the Pay Roll Reber signed on with the government last June to work full time at his hobby. Since then he has dismantled his equipment, shipped it east, and installed it at the Bureau’s radio propagation laboratory at Sterling, Va.—a great, flat, lonely field stretching away from a narrow red clay road and dotted with a few shacks and many antennas. It is a pretty good substitute, he thinks, for the desert he longed for when Wheaton spark plugs popped all night. He has also adopted two German Wurzburgers to his work. A Wurzburger is an early warning device, a type of radar, made of steel mesh 25 feet in diameter. It resembles a hollowed-out quarter of an orange. Fitted with electronic equipment devised by Reber and trained on the sun by automatic control, the Wurzburgers take care of the solar radiation part of the program while the “telescope of tomorrow,” more suitable for Milky Way investigations, probes the rest of the universe. Working full time and with the help of other Bureau scientists, Reber hopes within a few years to collect data that will tell broadcasters what frequencies they can expect to have jammed by cosmic and solar static, and how close together FM and television stations ought to be located if the public is to get the fullest benefit from them. He hopes to learn, also, where these heavenly broadcasts originate, and why. To Seek Celestial Elements Right now he has these facts to go on: The cosmic radiations come from the direction of certain points in the Milky Way; with a few exceptions, he receives none from bright stars in other parts of the sky. So he concludes that the broadcasts arise in or behind the dark, gaseous clouds that form half of our supergalaxy. If so, why? We might know if we could learn what these clouds are composed of. Under certain conditions, each element sends out radiation of a certain frequency. The problem is to find the frequency and to build a set that will receive it. Reber is now finishing a set, to be used with his mirror, for tuning between 1,400 and 1,450 megacycles. “A smart Dutchman at Yerkes,” the astronomer H. C. Van de Hulst, has told him that there he may find hydrogen. If he does, he will then look for other elements. This will still leave the final cause of the celestial broadcasts up in the air—or, rather, up in the empyrean where they come from. Perhaps they are one of the results of atomic fission in various cosmic laboratories. If that is so, the radiation has lost most of its energy before hitting the mirror of tomorrow’s telescope: it wouldn’t hurt even a Hiroshima flea. Whatever the cause, the waves do have something to tell us—as immediately practical as where to spend millions of dollars on high-frequency broadcast stations, and as fundamental as the nature of the universe in which we whirl out our days. Fascinating. From the tenor of the article and the descriptions of the telescope I take it the term radio telescope was not in general usage as of yet. Also amusing that he ended up using recycled German radar dishes.,..hey, why not? Beats building it yourself if the math for the curvature works for you. That wasn’t the only recycled German stuff that we used; V-2 rockets from Germany were used just after the war. Also, not just atomic fission, but fusion. Amazing how the technology evolved in just 50 years. The German Wurzburg wasn’t quite what we think of when we think radar. It was more of a radar ranging device than a detector. The device had to be pointed at the target through a system of hand wheels. JM: Not always. The ‘Chain Home’ coastal defence radar didn’t move at all, but used tall mast antennae that looked like high voltage towers. “Chain Home Low” was the one with the “rotating bed springs” antennae: it filled in the gaps of the main system. The Chain Home system was different as well. Each station ‘spotlit’ the sky with a continuous stream of HF pulses. A target was detected and the distance to the target determined by the reflection. With a second station position could be determined, and with multiple positions speed and bearing could be calculated. the genius of the Chain Home system lie in the chain part as all the stations were interconnected with a centralized control collecting and disseminating the information. The invention of the cavity magnetron by John Randal and Harry Boot in 1940 led to what most people think of as radar. The cavity magnetron allows for small powerful radars, using small antennas, with a high degree of resolution. This allowed the Allies to build single radar set that could do Range and Direction. And lately there have been several radio telescopes in different continents acting as interferometer resulting the antenna diameter being almost the size of the Earth. VLB being a part of it. Can’t find the link now….